Hi everyone, it’s Tamara Kate here with you today. 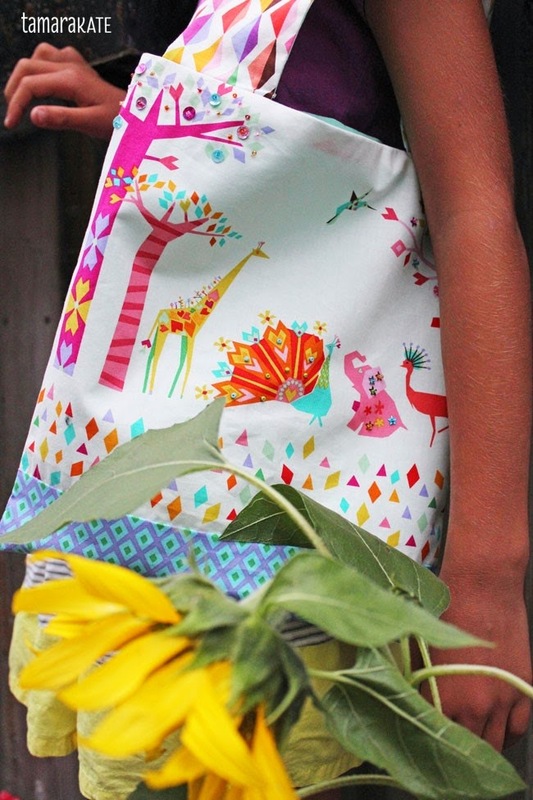 You may be familiar with my work as one of Michael Miller Fabric’s licensed fabric designers, or through my blog, kayajoydesigns. Today, however, I am delighted to be here as an avid sewer, Mom of two who are learning to sew, and this week’s guest Camp Counselor in the Kids Summer Craft Camp Series. 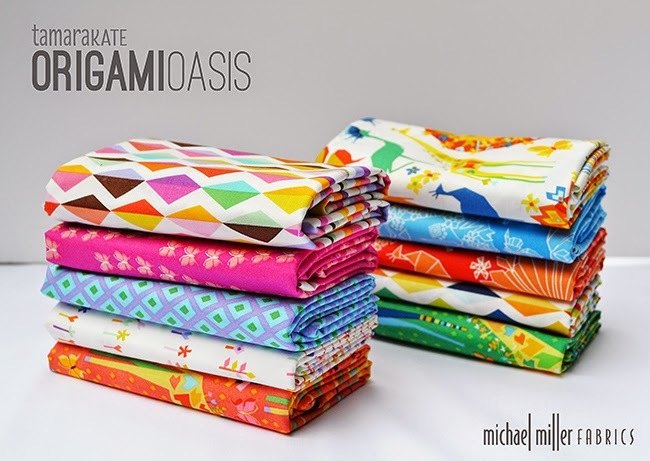 Well, ok, I am also here with my fabric designer’s hat on, as I get to give you a peek into the world of wonders that is Origami Oasis, my new fabric line about to hit stores in September. 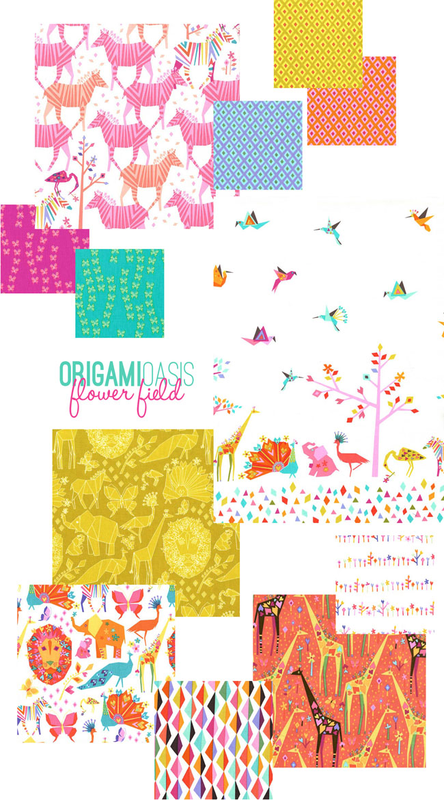 Origami Oasis is a graphic, young, lively collection, comprised of three color groupings, offering a myriad of possibilities for boys and girls, so everyone can get in on the fun. This project uses fabrics from the Flower Field group. I asked my eight-year old daughter, Emma (who recently received a sewing machine as a birthday present) what she would like to learn to sew for this series, and we went back and forth on a variety of ideas, but came to rest on something functional that she could sew on her machine and that she could have fun embellishing as well. Thus we created the Lined Tote Bag. 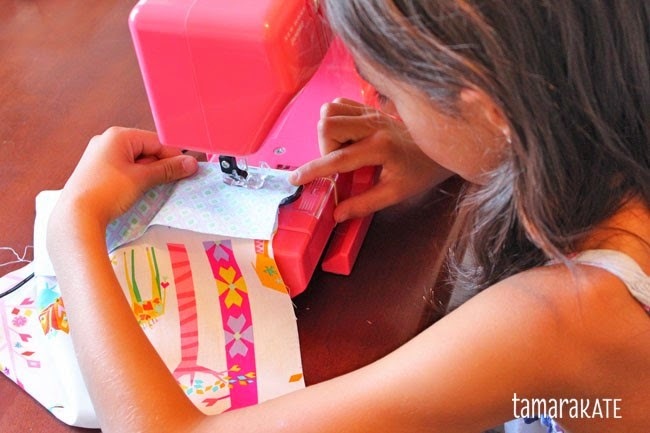 Your camper will need basic sewing skills and use of a sewing machine for this project. 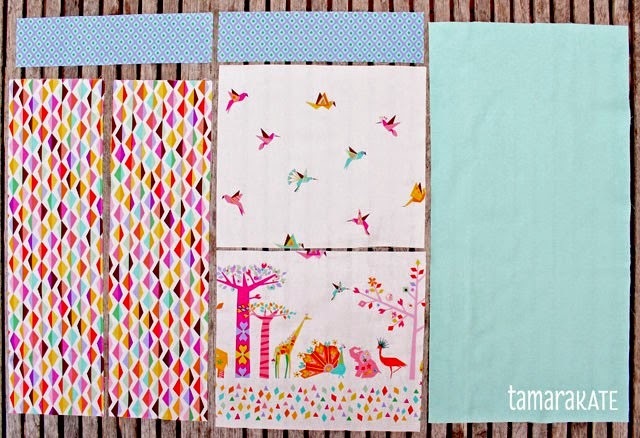 If he/she is new to machine sewing, I find these sewing sheets, by Skip to my Lou, great for getting comfortable before diving into the project. So campers, let’s get started. - Embellishments: a variety of shapes & sizes of sequins and glass seed beads. Cut your fabric as indicated above. We sewed on sequins and glass seed beads in strategic spots, giving the trees fruit and flowers and giving some of the animals just a little more pizazz than they already have. 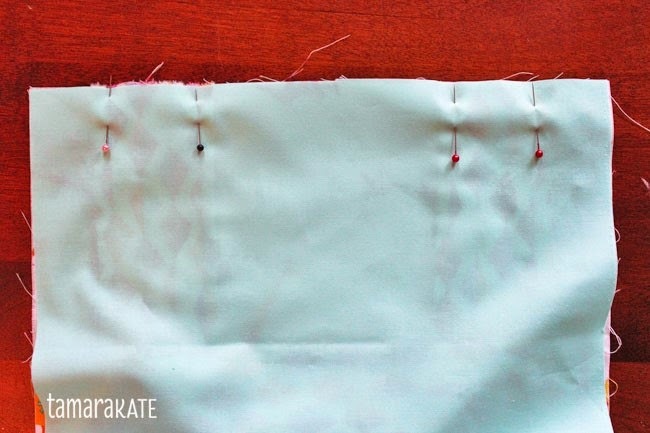 Here’s a quick how-to: Using regular sewing thread and a fine needle, knot your thread and bring your needle up through the fabric to the right side. Thread the sequin onto the needle and pull it down to the fabric, then thread a bead on. Pass your needle back through the hole of the sequin to the back of the fabric & pull the thread all the way through. Keep the beads and sequins in a concentrated area for more visual effect and don’t leave too much loose thread dangling at the back between beads, as it can easily get snagged on things and create problems. Be sure to knot your thread securely at the back of the fabric. 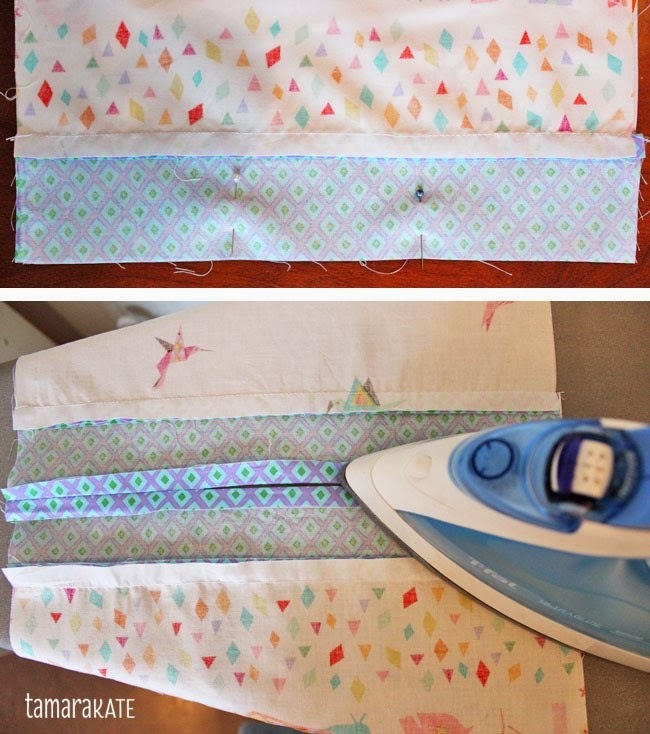 The machine sewing: We used ½” seams in all places. 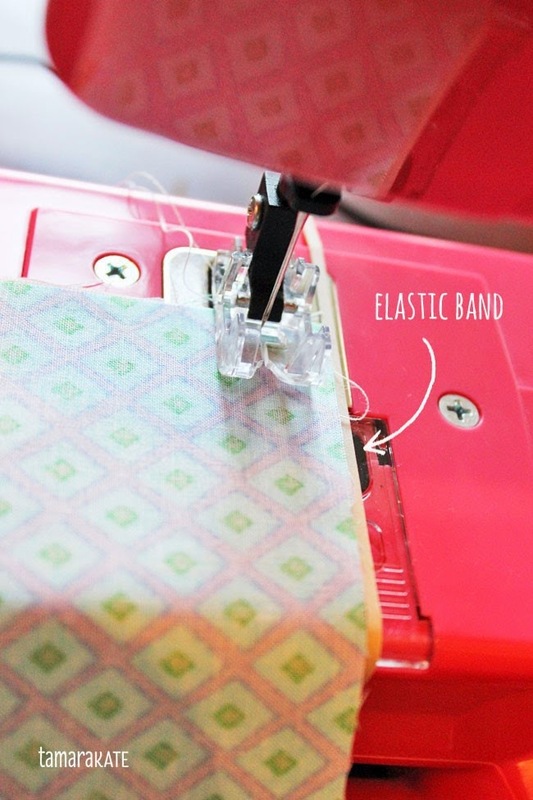 Here’s a tip we use to help with sewing straight lines: Place an elastic band or a piece of masking tape around the base of the machine exactly ½” from where the needle descends, giving a bold visual of where the fabric edge should stay. Ask an adult to help with any ironing. 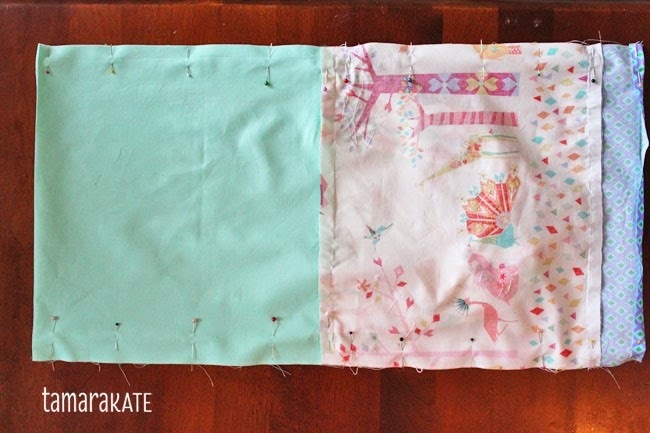 The front and back: With right sides together, place B on the bottom of A, aligning edges and stitch across the width (tip: if your B fabric is directional, make sure to turn it upside down). Repeat for the other side. Iron seams toward fabric B. 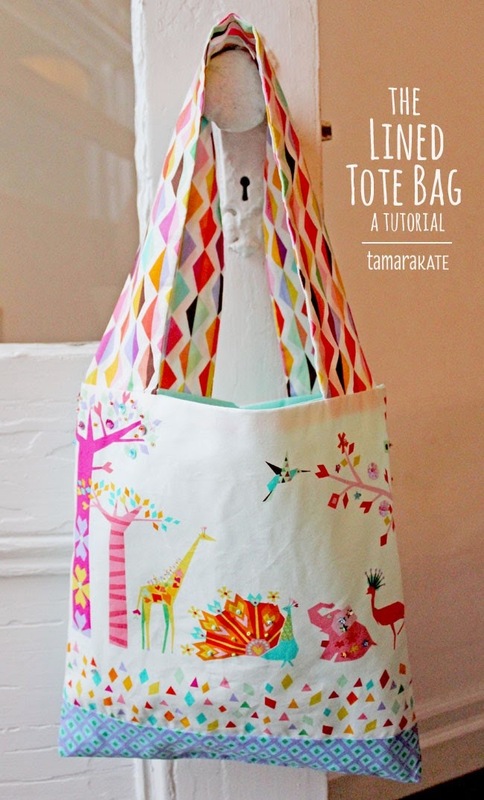 The bottom of the bag: Right sides together, place one bag side on top of the other, matching bottoms. Measure in about 4” from either side at the bottom and place pins at these points. Sew in from each side, backstitching at the pins, leaving the center area open. You will use this opening to turn your bag right side out later on. Iron seam open. The straps: Fold one C piece in half along its length. 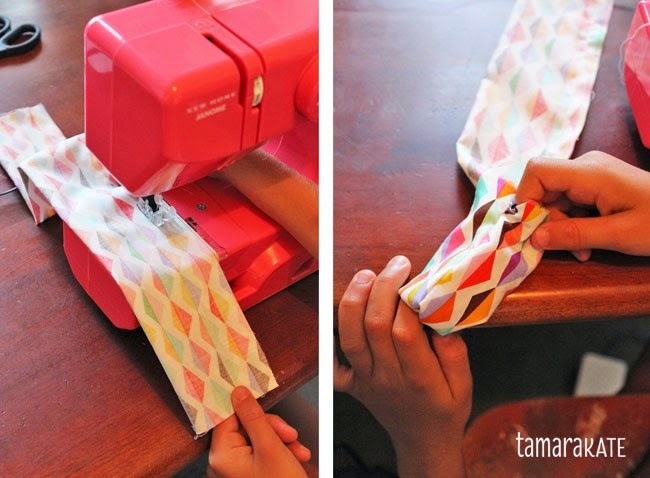 Sew the long raw edges together. Turn the strap right side out by pulling on the inside with your fingers. Repeat for the other strap. Iron the straps flat, seams to one side. Attaching the lining & securing straps: Place one strap in a “U” formation at the top of one of your bag sides, aligning raw edges and leaving 1½ ” of free space at both right & left edges of the bag. Make sure the bottom of the “U” looks like the picture below. Carefully place piece D on top, aligning edges, and pin the strap securely in place. 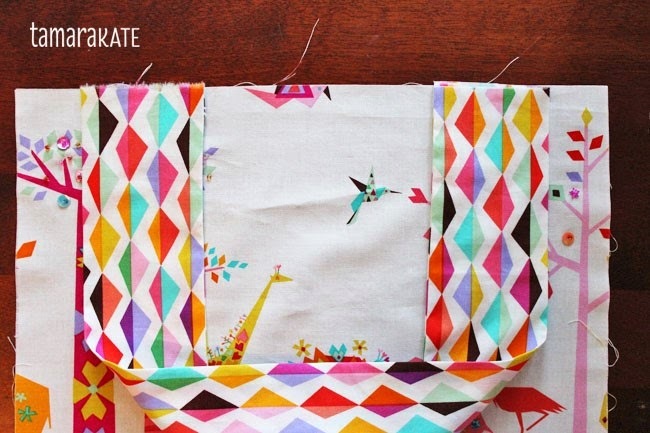 Sew along the top edge. Repeat with the other side. Iron both seams toward the lining. The sides: You should now have a tube of fabric, with your straps on the inside. Adjust the tube so the seams you just created are in the center and the base with the opening is at one end. Pin along both long edges, making sure not to catch the straps in anywhere. Sew both sides, backstitching at each end. Turn the bag right side out through the opening left in the base. 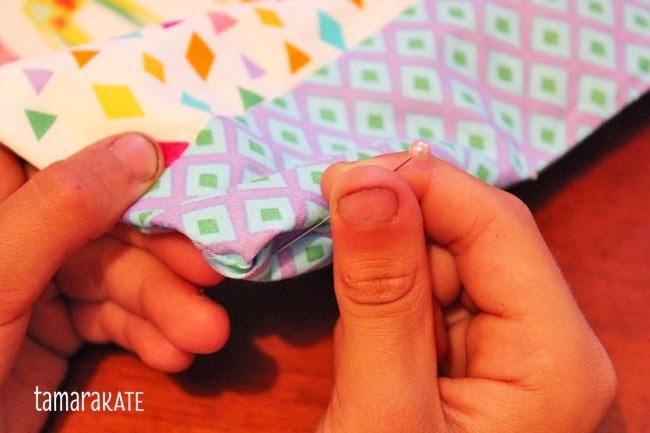 Stitch the opening closed by hand using a whipstitch, trying to keep your stitches small and close together. Knot your thread at the end. Before cutting the thread, pass your needle through the fabric at the end of your stitching and back out again 1” further along. Gently pull on the thread to pull the knot through to the inside of the bag, then cut the thread. Insert the lining into the bag and pull all corners out sharply (you can gently use a pin to help). Iron your bag to have a crisp upper edge and to remove any creases. Be proud of what you’ve created & enjoy using it! 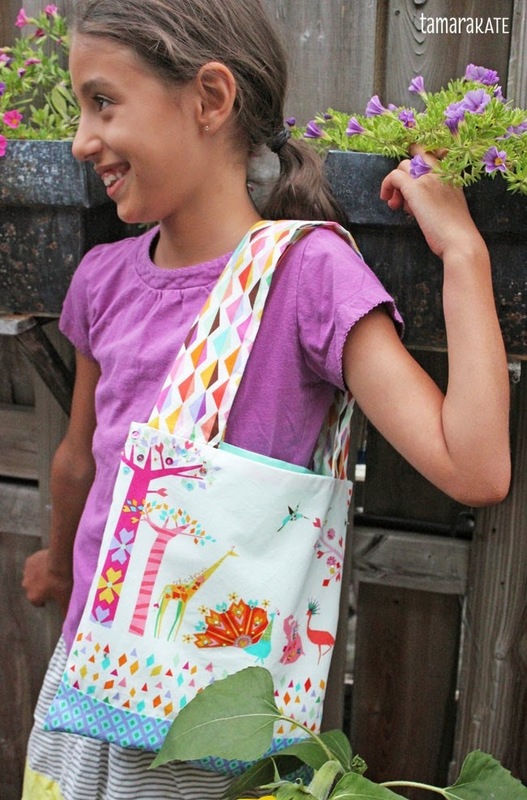 Send us pictures of your child's work in progress or their finished tote using Michael Miller fabrics and two lucky campers will win a bundle of Origami Oasis! 1. Help the kids photograph their projects and then send them to us! We'll pick the lucky campers after Labor Day weekend!